ST. GEORGE – Mathias Hecht from Willisau, Switzerland, set a new course record at the Ford Ironman St. George on Saturday with a time of 8:32:03. This is a new course record by eight minutes. A close second, Maik Twelsiek came in at 8:33:46. Twelsiek is from Germany. Third place went to TJ Tollakson, from Des Moines, Iowa, at 8:40:20. For the women, Heather Wurtele flew in at 9:30:33, shaving down her 2010 first-place time by five minutes. Jackie Arendt from Madison, Wisc., ended up second in the pro women’s race with a time of 10:06:36. It was her first Ironman event as a pro. Uli Bromme from Boulder, Colorado, finished third at 10:10:48. Survey results indicated that 85 percent of participants were new to Ford Ironman St. George this year, and 55 percent were introduced to the St. George area with this race. Approximately $5-6 million is estimated to be generated from this weekend’s event with an additional $1 million in consumer spending prior to race week. The majority of participants at Saturday’s race were from the United States, with 1,680 registered athletes. The following countries also made a significant showing: Canada (63), Great Britain (27), Japan (22), Australia (18). By US state, the largest number of athletes came from California, which boasted 431 registered participants. Utah residents followed with 307 participants, and Arizona came in third largest at 114 participants. By city, St. George residents made up the largest registration roster with 38 bib numbers sported at Saturday’s event. Salt Lake City residents made up the second largest group with 35 athletes, and San Diego residents totaled 29, the third largest group. The youngest participants at Ford Ironman St. George 2011 were Zach Smith, 18, from Nesa, Fla., and Aubreeann Heninger, 19, from Gilbert, Ariz. The oldest participant was Bob Heins, 72, from Plattsburgh, New York. 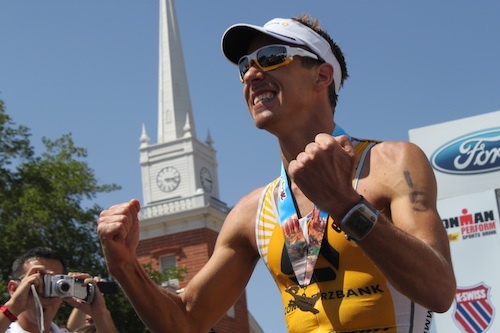 Ford Ironman St. George was the first Ironman ever for 598 participants. Of the total number of participants, 18% were female and 82% were male. For photos and more information, visit www.ironmanlive.com.